FlashDisk HX-2U24 High Performace Hybrid Disk Array delivers 500K Random IOPS and 12 GB/s data throughput. FlashDisk HX – Rear View – Fully populated with host boards. FlashDisk HX – Front View – Shown with two 2U, 24-drive expansion shelves. FlashDisk HX supports up to 14 expansion chassis that can hold either (24) 2.5” HDD/SSDs or (16) 3.5” HDD/SSDs with a maximum of 360 drives total for a maximum capacity over 1.6 PB. This 14th generation FlashDisk expands controller cache eight-fold to 128 TB maximum, to support high speed across all the storage using the fastest DDR-4 memory. 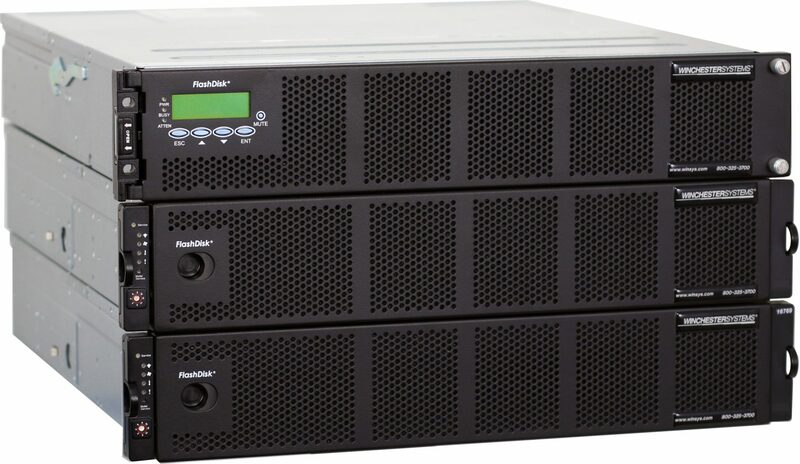 Optimized for performance, FlashDisk HX delivers performance for all of your application in a single, affordable and expandable system.